because the small daughter picked out the fabric and asked nicely. Our little Kate is in an I Want To Wear My Sisters' Clothes phase. 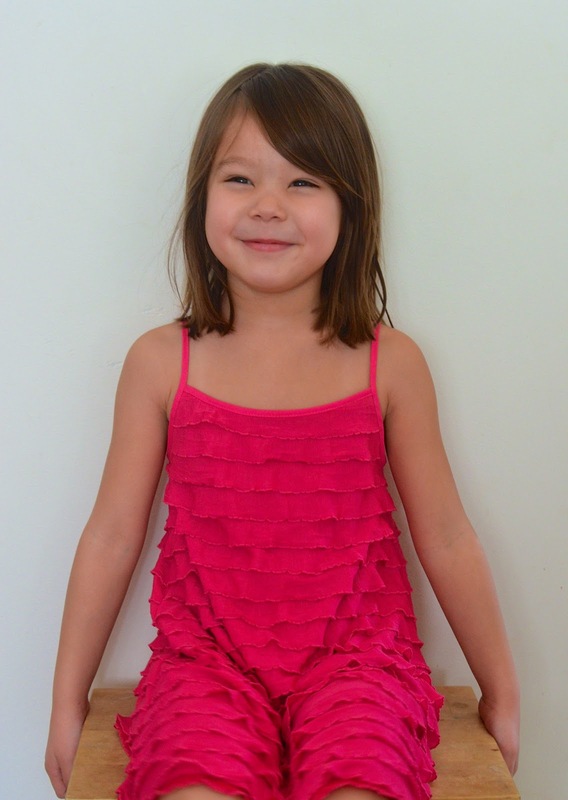 She borrows Jenna's dresses and believes her sisters have better clothes than she does. She also has extremely particular requirements for whatever goes on her body e.g. There cannot be yokes, because the seam between the yoke and the skirt is scratchy and tight. The sleeves cannot be tight. The sleeves cannot be fancy. The dress cannot be too tight and cannot be too loose. The dress cannot be puffy in the wrong places. The fabric must be soft. There cannot be scratchy seams, tags, embellishments etc. 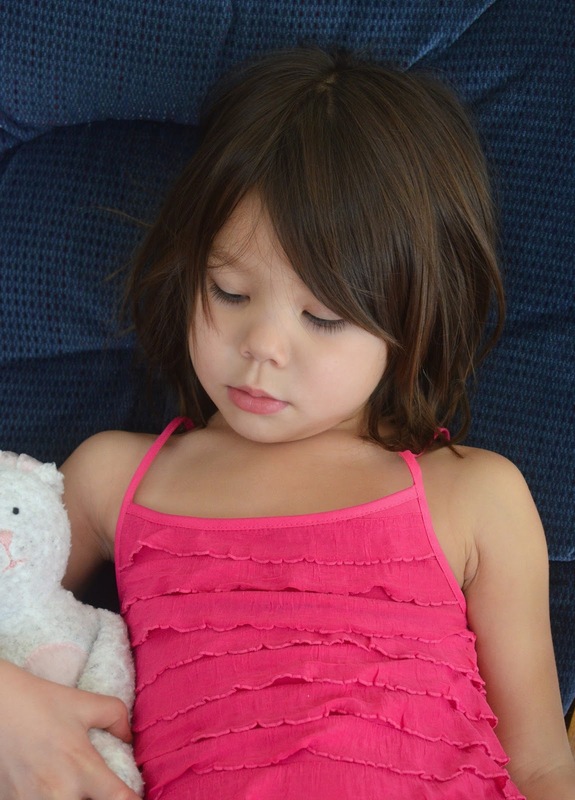 I sympathize to an extent because as a child, I was made to wear scratchy, cottony, lacy (i.e. scratchy) dresses, with matching lacy (i.e. scratchy) cuff socks and hard, patent-leather Mary Janes. My friends used to tell me I looked like a present, all wrapped up. Bah. So now that I have my own children, I try not to make them look like wrapped gifts. 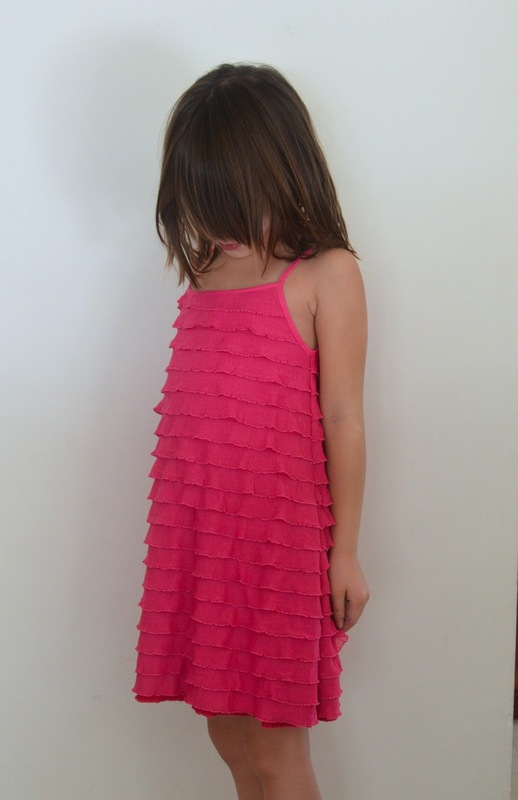 And sometimes I let them pick fabric out at the store to be turned into dresses when I have the time. Which isn't often, I'll admit. 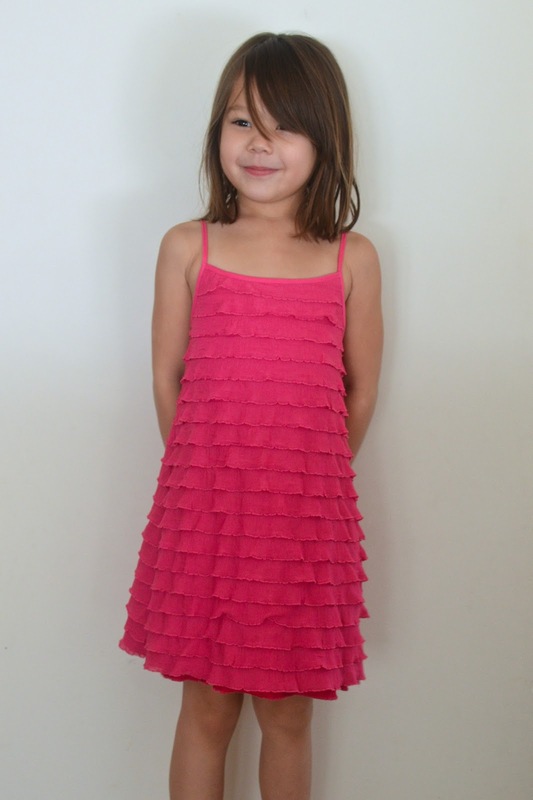 I've discovered a wonderful rule-of-thumb that has done wonders for my sewing-for-children: if I don't want them to choose wrong fabrics for dresses, I must only let them browse the apparel fabric aisles. This conveniently rules out the fabrics that they adore because they are colorful (i.e. quilting cotton) but which they NEVER wear once they are actually made into dresses because they are too stiff, or fabrics that are pretty and sparkly (i.e. the special occasion satins, sheers and tulle) but which are only ever useful for Halloween costumes. Now, your children may be different from mine and may love their cotton dresses, so don't let me dissuade you from shopping in whichever aisles bring you success. My children, however, have tricked me so often with their fabric choices that I cannot afford to let my guard down. Suspicious and unyielding as I am with fabric types, I am also very generous once my girls are correctly installed in the appropriate aisles. And by "generous", I mean "am okay with pink." Last month, in an attempt to cope with the neverending winter, we went summer fabric shopping at SR Harris, our lovely local fabric warehouse. Frantically ushering them past the home-dec and designer cotton aisles, while muttering, "Don't look! Not good cloth." I led them to the knit section and declared that they could pick stuff out for clothes. Unsurprisingly, everyone picked the gaudiest and most sparkly fabrics there were and asked for party dresses. Kate, especially, was very enthusiastic, citing the My Sisters Have Nicer Dresses claim to help in her bargaining. Some skillful expectation-management later, during which I discreetly tossed out a bolt of black powernet embossed with metallic rainbow letters and disco stars, Kate settled on this rose-pink frilled fabric, which finally became her dress yesterday. Very straightforward: it's an A-Line tank dress with bound armscyes. Textured fabrics are so wonderfully rich that I usually pick very simple styles and clean lines when I sew with them. That said, working with the fabric itself was a bit of an exercise in patience not only because the frills had to be matched at the seams like stripes but also because they were so fluid. I actually basted them down just to keep them from folding over themselves and getting cut badly. Famous last words. The front neckline still lost a frill (note to self: do not perform layouts on finicky fabrics when half-asleep) and I had to manually graft one back on. This fabric had to be lined, incidentally. I found an unmatching darker rose-red sparkly knit at a different store last weekend and made the dress reversible. I mean, if I'm going to line it, it might as well be a second dress, right? Works with bags, at any rate. And this way, Kate will now have two dresses. Reversible meant doing a proper bias-bound armscye with the ends of the bias tape pre-connected rather than hideously overlapped or sewn into a seam. It's a heavy dress, with those two layers of knit. Not floaty like cotton, but drapey and soft. And for that reason, I decided to use regular cotton bias tape instead of binding the armscyes with knit like I often do with my knit dresses. 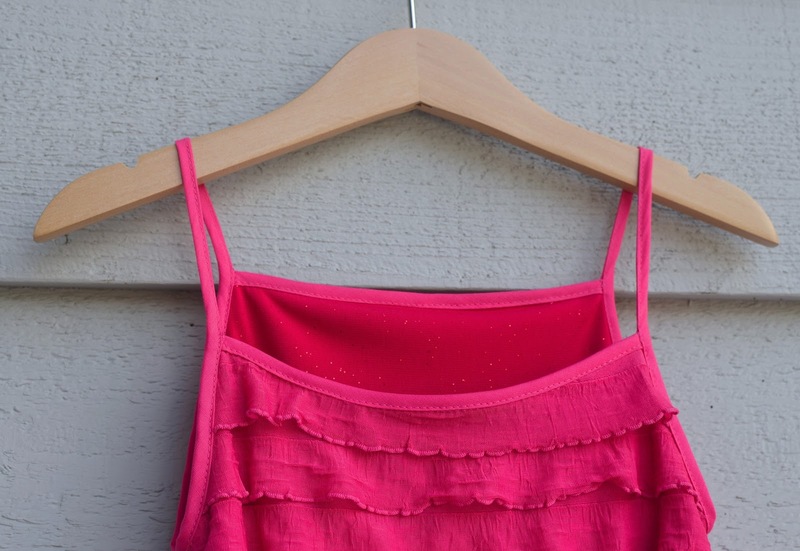 This way the straps don't stretch over time and sag the necklines. It may not look it (because the fabric drapes so well), but I actually made it in Jenna's size because I didn't want any complaints of "too tight" and other such nonsense. Now, Kate doesn't look like a wrapped gift, but there is an air of pinata-ness about this dress that amuses me. Overall, I think it's pretty and I'm actually tempted to make one for myself just like it, but maybe in ocean tones. Anything to channel summer! she looks so happy about it! I think it's very pretty! I just made my girls skirts out of pre-ruffled fabric. It is definitely interesting to work with. The dress looks cute and super comfy. She looks so thrilled with the dress! It is very pretty. Pre-connecting the bias tape is genius. 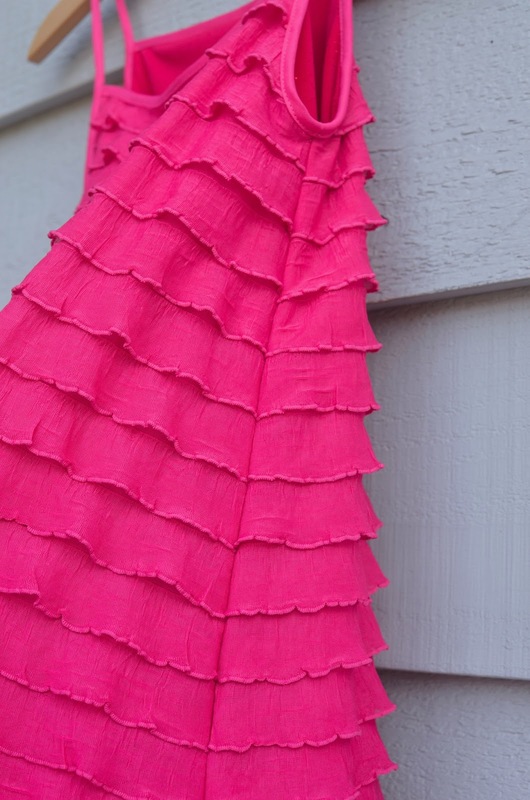 Lovely dress and even more cololer that it is reversible. 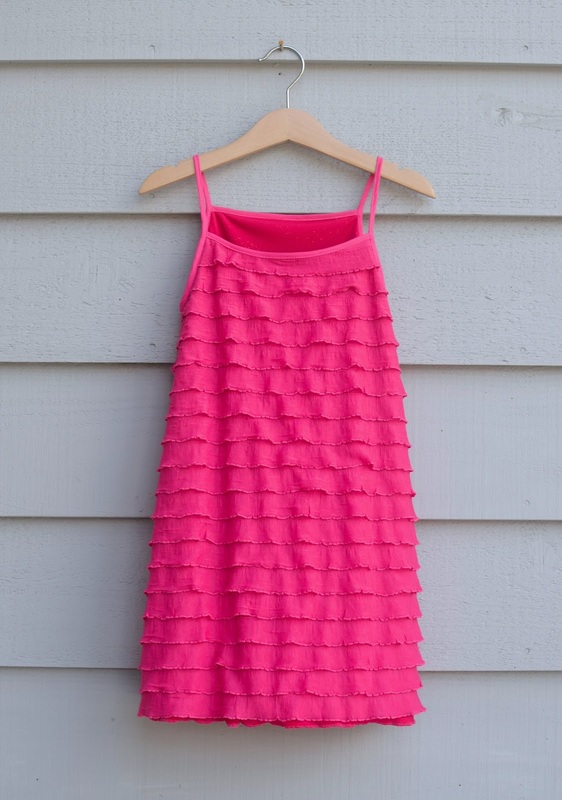 I have similar fabric in grey shade and had made a skirt for daughter and self, leftover can make a tank top, but I doubt if my daughter would wear it as reversible as she will complain that frills when worn on inside itches her skin... Tantrums of kids whose mom sews! Love, love, LOVE it!! And looks soooo comfy! You are too funny! Thanks for making me laugh. She looks so pleased, way to go mom! Love the dress. Also love the way you write, you always crack me up. It's very pretty, and she looks so happy ! 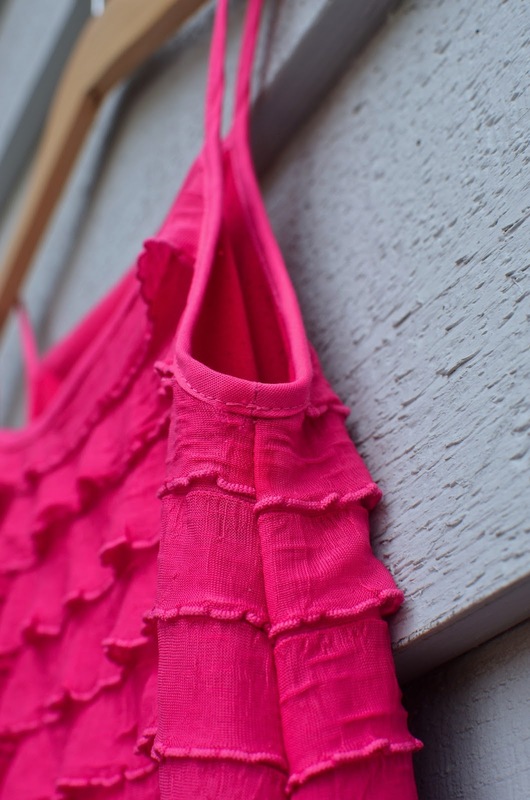 It's a great fabric for a little girl's dress. I have to go to that store... soon. My granddaughters would love, love this dress. I happened to purchase a bright yellow pure ruffled fabric recently but unsure what to do with it. Did you use a pattern? No, Barb, I didn't use a pattern. I don't sew with commercial patterns. This one was drafted from measurements. 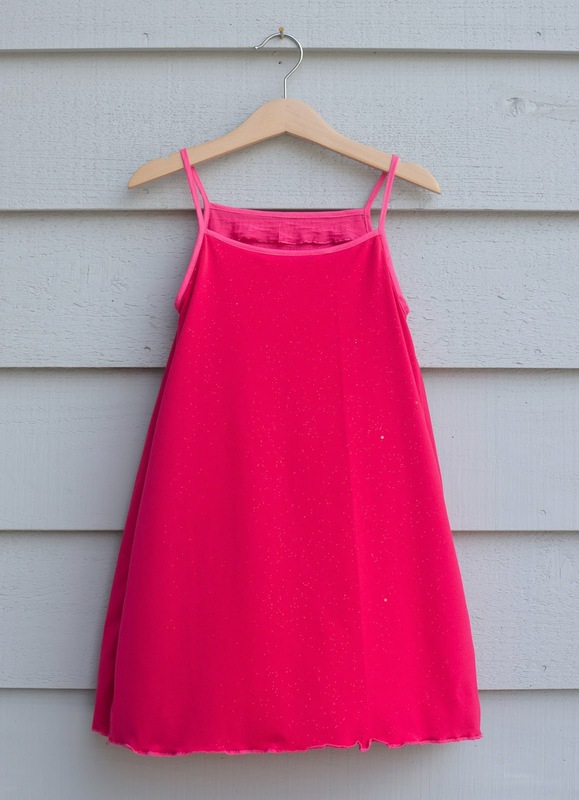 However, this being a tank dress, you can use any camisole-y tank-y type pattern (even an existing garment that your granddaughter(s) already wear) and flare it from the armpit to the hem and you will get this pattern.